IF YOU HAVE A FEAR OF PUBLIC SPEAKING, you probably already know that preparation is NOT the key to making the fear go away. That may work for people who are just nervous, but it won’t work for someone who experiences intense feelings of panic and anxiety just by thinking about it. What they need is a phobia specialist. 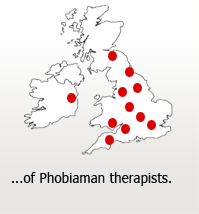 I’m Alex, veteran member of Paul Mckenna’s Training Team and Treatment Director at The PHOBIAMAN Clinic. 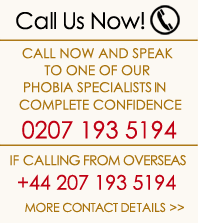 Over the last 13 years I have put together a team of the best phobia treatment specialists anywhere. We are professional, full time therapists and we may be able to help you overcome fear of public speaking in just two or three sessions if you’ll only allow us to. That may sound like a wild claim right now, but when you stop to consider that we have already helped over 9000 others*, hopefully it begins to sound a bit more real. 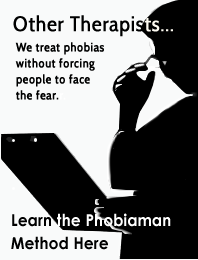 Luckily, here at The PHOBIAMAN Clinic we specialise in treating Phobias, so we understand what it’s like to have a real fear. And we know that fear of public speaking, despite being one of the most common phobias, is NOT necessarily a learned behaviour like other phobias. This means it won’t always respond to the common methods that non-specialist clinics rely upon, like relaxation techniques. Being specialists means we get to work with more phobias than if we tried to treat everything. This has allowed us to notice patterns and to develop our own methods based on what we have found to work* for the thousands of other people we have already treated just like you. This is one reason why our success rates are higher. And our training and experience help too. Not only are we phobia specialists, we are also world-class experts in Eriksonian Hypnotherapy and Neuro Linguistic Programming (NLP). We don’t say this lightly, either. 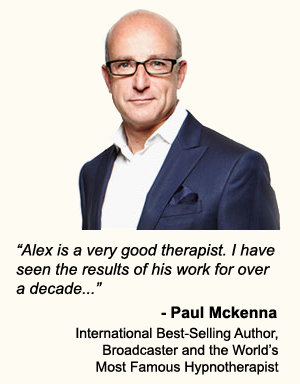 As veteran members of Paul Mckenna’s training team, we help Paul and Dr Richard Bandler – the man who thought it all up – deliver the largest NLP and Hypnosis trainings in the world. There is no team with more experience anywhere, and all this means we deliver the most powerful and thorough phobia treatment programme available today. Public speaking involves skill and planning, but they are skills you can only learn once the fear has gone. And we can help you here too. 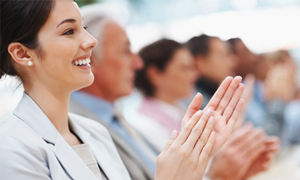 As members of Paul’s training team we know how to deliver to an audience. More importantly, we can teach you how to do the same. And we can give you the tools you need to be successful*, whether it be a sales or business meeting or presentation, a formal speech, a wedding speech, or delivering a lecture or training. In short, we can help you get rid of the fear* and then teach you the skills you need to deliver a memorable and interesting presentation to an audience of any size with confidence. If you would like to find out if our treatment is going to be right for you, the first step is to call the PHOBIAMAN clinic and speak with one of our friendly therapists and see if we can help. Just call 0207 193 5194 and speak with a specialist today.